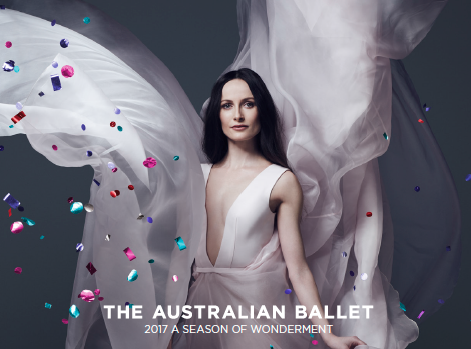 The Australian Ballet’s 2017 program combines outstanding classic and contemporary works, and will showcase the artistry of dance with the story ballets Alice’s Adventures in Wonderland, The Sleeping Beauty and Nutcracker – The Story of Clara, while also offering contemporary works Faster and Symphony in C.
Artistic Director of The Australian Ballet David McAllister said, “It’s a season defined by exquisite performance and the adventures of three extraordinary women; we fall down the rabbit hole with Alice in Christopher Wheeldon’s Alice’s Adventures in Wonderland, we follow the life of a Russian ballerina who arrives in Australia in Graeme Murphy’s Nutcracker – The Story of Clara, and then Princess Aurora leads a cast of fairytale characters as she searches for her Prince in The Sleeping Beauty. ALICE’S ADVENTURES IN WONDERLAND – Magnificently theatrical and bursting with invention, Christopher Wheeldon’s full-length Alice brings to life the vivid visions of Lewis Carroll’s classic book. 2017 will also include The Australian Ballet’s Storytime Ballet tour, Ballet Under The Stars outdoor performance, Telstra Ballet Dancer Awards, The Regional Tour, an extensive education program that tours to primary and secondary schools across the country, Step Inside’s audience engagement program, World Ballet Day and Orchestra Victoria’s performance and festival programs. For full season details, visit australianballet.com.au. 2017 Season Packages for Melbourne and Sydney are now available. Watch the introduction to the 2017 season here. Next Post At last ... Dance Dads!